Afford Yourself Excellent Sound Quality Of Your Favorite Songs Anywhere You Go By Alpha & Delta - Starting Today! Are you an avid audiophile and lover of the action life? Do you want your music to be with you anywhere you go? 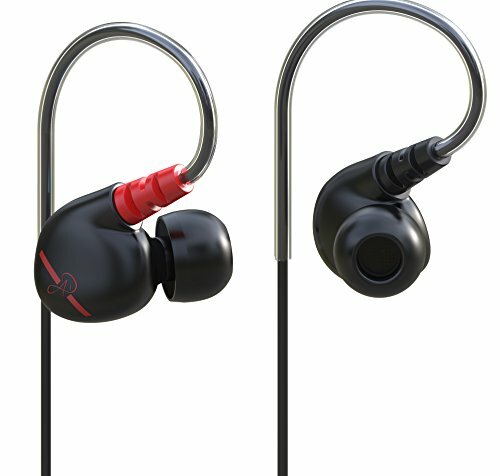 Are you looking for a high quality, yet affordable pair of earphones? If your answer was "yes", then look no further! D2 High fidelity sport earphones by Alpha & Delta are just the thing you're looking for! With an IPX4 sweat resistant system design, a warm punchy bass sound signature and a volume control, it's the best company an active music lover can have; for any type of exercise and workout, these little fellows will stay put and keep giving you rhythm! Either it's your fitness lover best friend, your spouse that has just started working out or even your always-on-the-move self, these earphones are the most practical, thoughtful, handy, fun and overall perfect gift you can think of! Apart from the standard pair of earphones, we have also included a practical shirt clip, 6 pairs of silicon tips and 2 pairs of foam tips, for cases of emergency tips loss - because at Alpha & Delta, our clients' satisfaction is paramount! Get Your Own Pair Of D2M High Fidelity Sports Earphones By Alpha & Delta Now - Before Our Supplies Run Out! •BRING ON THE MUSIC WHILE YOU WORK OUT: It's a common secret that music boosts your spirits and keeps you motivated while you're exercising at the gym or jogging. Let our amazing earphones be your fitness partner from now on! •STURDY CONSTRUCTION & SUPERIOR QUALITY: When it comes to our high fidelity earbuds, we make a point of using nothing but superior materials and modern production processes, so that we can be certain they meet the high standards of our customers - you! •ACCLAIMED BY THE WORLD'S LARGEST EARPHONE FORUM: The world's largest forum community about earphones, Head-Fi, regularly reviews pairs of headphones - and it has given our D2M earbuds an astounding 4 Star review! •MULTIPLE BONUS ACCESSORIES: As if quality and excellent technical specs weren't enough, we decided to add a ton of accessories in our package; a shirt clip, two pairs of foam tips and an amazing six pairs of silicone tips! If you have any questions about this product by Alpha & Delta, contact us by completing and submitting the form below. If you are looking for a specif part number, please include it with your message.